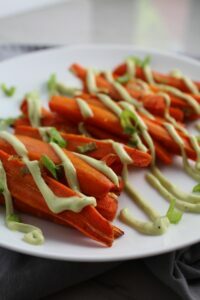 Roasted Carrots seasoned with smoky cumin, scallions, salt and pepper and then topped with a creamy and tangy Avocado Crema are such a delicious and quick side dish for a family dinner. 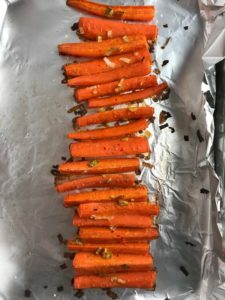 The roasting brings out all of the natural sugars in the carrots, so they get this sweet caramelization in the oven which combines with the salty and smoky cumin seasoning so wonderfully. The Avocado crema takes it over the top with a creamy and silky balance. Absolutely a must-make side dish! Carrots are a staple in my house. 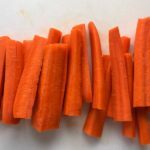 When all else fails on the veggie front with my girls, I know that I can always pull out some carrots and feel good that they ate something healthy and nutritious with their dinner. 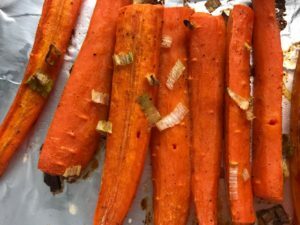 Roasting the carrots is great way to change it up and change the flavors a bit to make carrots more exciting. Adding just a hint of cumin gives just a bit of Mexican-inspired smoky flavor that pairs so wonderfully with the Avocado crema. 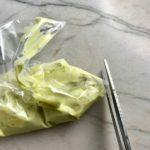 For this super easy recipe, you can prepare the cumin, salt, and pepper mixture ahead of time, by just mixing it in a baggie or a small bowl and covering it until ready to use. In fact, I like to make this in a bigger batch and store it for use in a variety of roasting adventures…roasted chickpeas, roasted cauliflower steaks, roasted broccoli…the list goes on! It’s a 1:1:1 mixture, so you can measure out a 1-2 tablespoons each of cumin, salt, and pepper and then use a pinch here and a pinch there. Next, prepare the carrots, by peeling them and then cutting them into equal size sticks, about 3 inches in length. 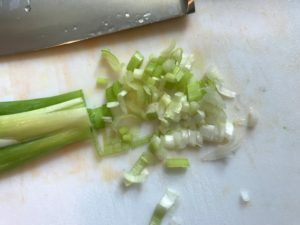 Last, you can finely slice the scallions, separating the whites from the greens. 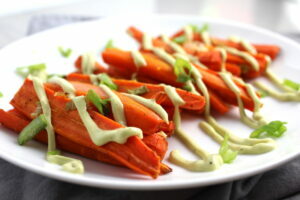 The whites will get roasted with the carrots and the greens are used to garnish and give a fresh burst of flavor. 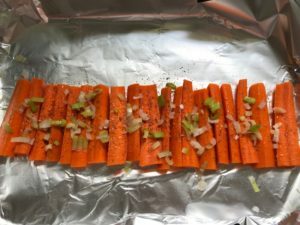 Arrange the carrots in a single layer on a pan lined with aluminum foil for easy clean up. Drizzle or spray with Extra Virgin Olive Oil. 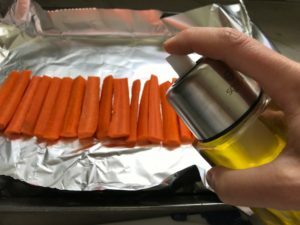 I love my Sonica Organics Oil Sprayer for this because it is non-aerosol (no toxins and propellants) and is so easy to pump, then spray.. Then sprinkle with the salt, pepper, and cumin mixture. Toss and rub the seasoning and oil all over each of the carrots. Spread the carrots out on the pan so that they are not touching. Sprinkle the Scallion whites over top. Roast in the over for 30 minutes or until fork tender. 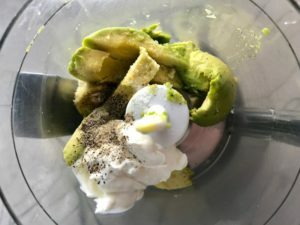 To make the avocado crema, place the avocado, sour cream, juice from half the lime, half and half (or milk), salt and pepper into a food processor. Pulse and then blend until smooth. 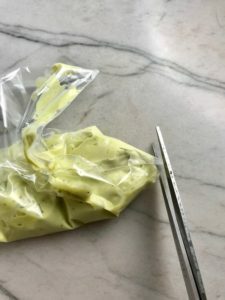 To make a pretty zig zag pattern with the Avocado Crema over the carrots, simply transfer the crema to a plastic baggie and snip off the very tip of a bottom corner. 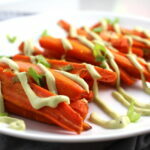 Using the baggie, squeeze the avocado crema over the carrots in zig zag pattern or any pattern you want! Sprinkle with the green scallion slices. 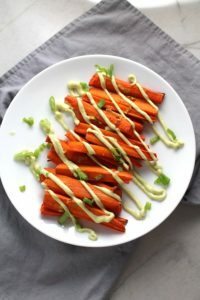 Roasted Carrots seasoned with smoky cumin, scallions, salt and pepper and then topped with a creamy and tangy Avocado Crema are such a delicious and quick side dish for a family dinner. 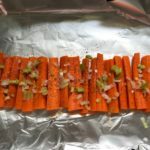 The roasting brings out all of the natural sugars in the carrots, so they get this sweet caramelization in the oven which combines with the salty and smokey cumin seasoning so wonderfully. The Avocado crema takes it over the top with a creamy and silky balance. Absolutely a must-make side dish! 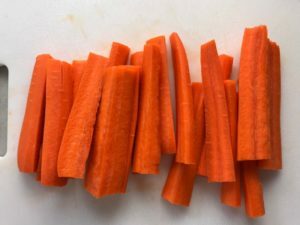 Peel carrots and cut them into equal size sticks - approximately 3 inches in length. 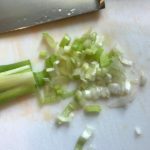 Slice scallions and separate the whites from the greens. 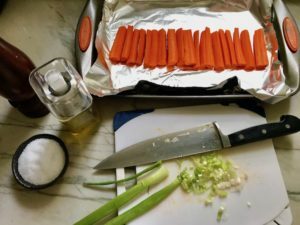 If you are prepping a day or more in advance, place the carrots scallion whites and greens into 3 separate baggies and store in the fridge. You can also prepare the salt, pepper, and cumin mixture in a baggie and set aside. 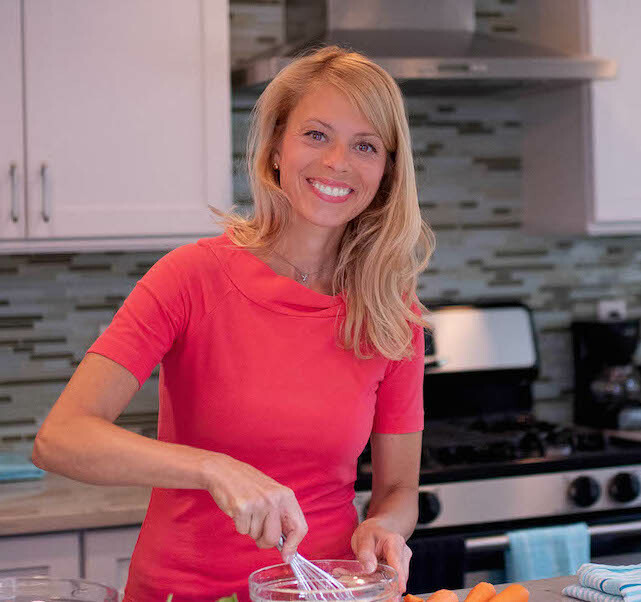 Arrange the carrots in a single layer on a pan lined with aluminum foil for easy clean up. Drizzle or spray with Extra Virgin Olive Oil. Then sprinkle with the salt, pepper, and cumin mixture. Toss and rub the seasoning and oil all over each of the carrots. Spread the carrots out on the pan so that they are not touching. Sprinkle the Scallion whites over top. Roast in the over for 30 minutes or until fork tender. 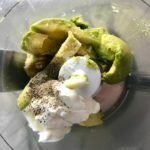 To make the avocado crema, place the avocado, sour cream, juice from half the lime, half and half (or milk), salt and pepper into a Blender. Pulse and then blend until smooth. 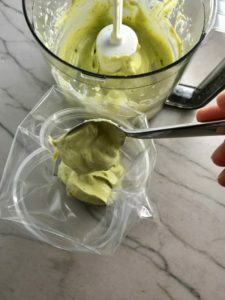 To make a pretty zig zag pattern with the Avocado Crema over the carrots, simply transfer the crema to a plastic baggie and snip off the very tip of a bottom corner. Then squeeze the crema over the carrots. Sprinkle with the sliced scallion greens. Enjoy! !